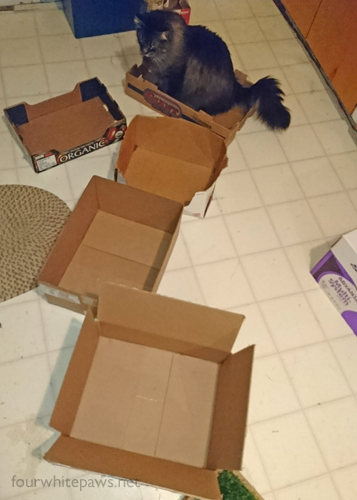 It's hard to believe that some cats have to make do with just one box. One box. That's not how we roll here. Nahum likes options. Kitchen floor space is overrated. Oh my, Nahum has plenty of box choices! 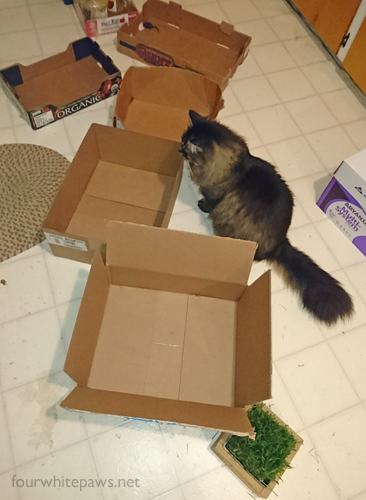 Am always amazed how round cats fit into rectangle boxes...lol! Absolutely, the more the merrier!!! Oh yes! Choices rule at my house also!! Like Goldilocks--better keep the one he likes! That's the problem, he likes them all! He'll use different ones at different times. I keep waiting for him to stop using one so I can remove it but he cycles through them! The one he occupies in the photo is his second favorite, his all time favorite is the very well used white one adjacent to the one he's in. We've had that box for years! He loves it so much, I have a brand new spare one of the same type waiting in the basement for when this one wears out. Your kitties are so lucky. I would do that too, but Penny pees in them.